As with any sport, body building can be expensive. 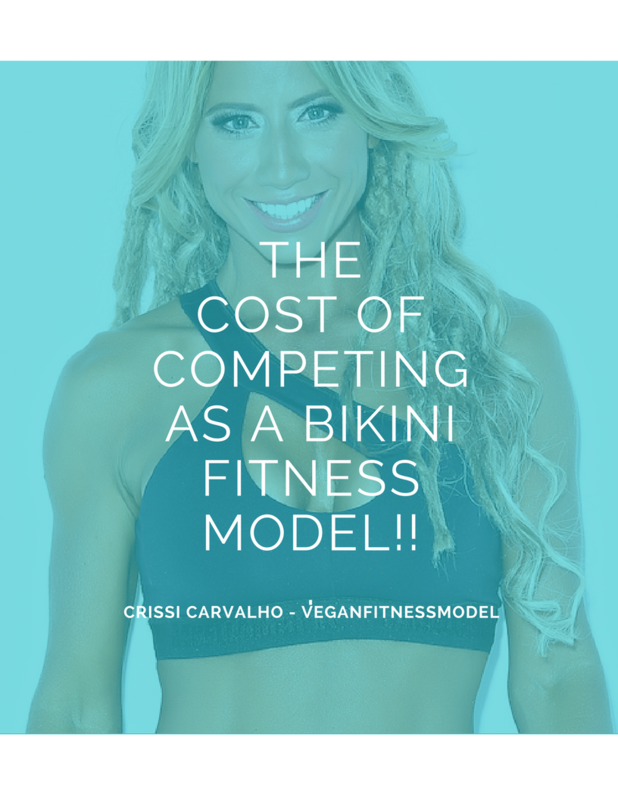 I’ve decided to write this in-depth list of the costs involved for all of you aspiring bikini fitness models out there! This list includes EVERYTHING I can possibly think of that you need to consider as a cost in your journey to stage – whether you are a bikini, fitness or sports model. For some things, I have also given them a priority marker on a scale of 1 – 10 (10 being the highest). This will help you decide whether you can skip it, budget it for later, or if need to be thinking about it right now! In this post, I look at the monetary cost factor only. However, TIME is also a huge and important investment in any competition prep – but that is a topic for another time! In-Person Coach: $50 to $100 per session/appointment OR some coaches may charge $50 – $100 per week, based on a 10 – 16-week prep contract. An experienced coach can give you the tools you need to get to stage healthy, on time, and looking the best you can. That includes planning how long your prep needs to be to achieve the best possible outcome. They help keep you on accountable and can tweak your diet and training as required. Most coaches will do weekly, fortnightly or monthly check-ins to track your measurements, body composition and energy/strength levels. Some competitors may benefit more from having an in-person coach, but online coaching is generally more cost-effective and convenient. This is often one of the largest costs for competitors. Online coaching – although lower in cost – isn’t personal enough for some competitors. When choosing a prep coach, do your RESEARCH! Look at their previous clients. How many bikini/fitness competitors have they prepped? Do you resonate with their approach and persona? Ask around at your local gym for recommendations. Otherwise, your federation may have preferred coaches which they are aligned with to help get you started. Even google search their background – have they competed themselves? How long have they been coaching? How long have they been in the bodybuilding industry? Are their beliefs (veganism) the same as yours? Hiring a personal trainer is a great way to stay motivated and accountable, push through barriers and train to grow muscle mass. When shredding, they can also push you harder in HIIT training. The cost factor is high. Personal Training can blow out all other expenses, especially considering you will aim for 1 – 3 sessions per week, over a 16-week prep. Also, if you have an online coach for your competition prep, their views and recommendations may not align with your PT’s beliefs and training techniques, which can be confusing and stressful for inexperienced competitors. TIPS: I personally enlist a trainer and/or attend classes throughout my prep. I have previously used a Personal Trainer, Boxing Trainer and Reformer Pilates Instructor to help me push harder and get next level results! This is an option for those that don’t need the extra support, or who are seasoned competitors. This option can save you loads on ongoing coaching. There is no extra support, tweaks, accountability or tracking of progress. This option is under estimated and under used by many coaches and competitors, as the idea of one-on-one coaching has become more popular. The reality is, although a one-on-one coach can be there to guide you and answer questions, at the end of the day YOU have to do the work for yourself. A good gym will have a vast array of equipment, personal trainers and other benefits such as saunas, massage therapists etc. You also get access to an atmosphere with other like-minded people working toward their goals. It is more expensive than creating your own home gym set-up. If you train during peak times, you may have to wait for the machines you need, which can affect your training intensity. Choose a gym which is close to home, has a motivational atmosphere and is open 24 hours for you to train. That way there are no excuses for you to avoid training or fitting in your cardio! The Federation hosting your competition may require you to register as a member and pay a membership fee, which is often charged annually. This is a prerequisite to you competing in the shows they host, however there are some shows which only require you to pay competition registration and a division entry fee. Registration fees are mandatory to enter the bodybuilding competition and are charged by all Federations to support their running costs. Posing can make or break your presentation and nailing your stage presence is paramount! An experienced posing coach will get you to stage moving and looking the best you can. They will work with your body type and help choose poses that suit YOUR body, PLUS the criteria for the show you are competing in. A face-to-face session will allow your posing coach to physically move you into the right position. In my opinion, having a face-to-face posing coach is superior to an online coach for this reason. It’s high cost, but it is essential. Online coaching or simply watching online posing videos is not personal enough for most competitors. When choosing a posing coach, choose one that knows the federation you’re competing in! Look at their past clients – how have they posed on stage and do you resonate with their style? Ask around at your local gym, or your federation, as many have posing coaches they are aligned with to help get you started. A vegan comp prep plan will cost $50 to $100 p/w approx. 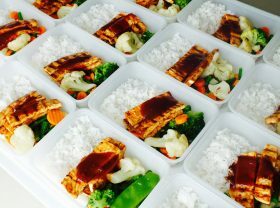 Omnivore prep plan will cost $80 to $250 p/w approx. You will save money on eating out, drinking alcohol, going to events etc. Your health will also be better from eating healthy, wholefood meals. You may get bored with the limited food choices. Vegan Fitness Model Plans are based on wholefoods and do not ‘cut out’ any macronutrients (such as carbs) or micronutrients. Doing a vegan, wholefood vegan competition prep will save you money in terms of the costs of ingredients. One of my clients calculated a total saving of $3,700 from no longer eating out over her 16-week prep! You may also need to invest in food scales, glass meal prep containers and download a food diary app, such as My Fitness Pal, or Cronometer. Supplements can help if your dietary nutrition is inadequate. Supplements are great for convenience, recovery, an energy boost or relaxation. Supplements are expensive and many have fake fillers in them. Some over-the-counter supps (including many fat burners) are illegal to use in certain competitions, so be sure to do your research before using any! In my opinion, supplements are over-rated. However, if they make competing easier for you – then great! Some competitors use them as a motivation to stick with the plan and many do swear by their supplements. 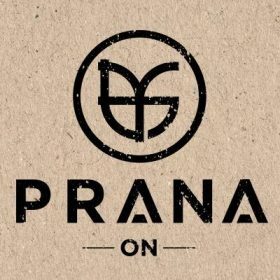 I competed for almost 2 years without supplements, then added in the Vegan plant-based protein powder ‘PranaOn,’ which helped me hit my nutrition targets. Plus, they taste great and are convenient to use! Choose a bikini designer that will make bikinis to ‘fit’ your body and the cut associated with the federation you’re competing in. If your suit has connectors, make sure they are good quality to avoid these breaking before, during or after you compete. Many girls have experienced this and it can be very stressful on your show day. While the cut, colour and style of your bikini is important, a bikini will not ‘win’ the show for you! Your physique and stage presence will! My recommendation is to choose colours, cuts and styles based on a previous year’s winner, as this may be preferred by the federation/judges. Also consider the stage lighting, your personal hair colour, and the look you want to portray on the stage. BOLD colours are great such as red, blue, green, black, bright pastels, purple/lilac and aqua! I would avoid choosing light colours such as white, yellow, peach or pink as these can easily get stained by your tan before you even hit the stage. There is also an option to hire bikinis or buy them second hand, which can save you a lot of money if you compete regularly. You could also buy a plain bikini and bling it yourself! Choose a dress based on what works for your own style preference and personality, and maybe even something you can re-sell or wear again after the show. Check the colours worn in previous shows and how they stood out on the stage. Consider the stage lighting, judging criteria and what the judges look for in general. These tests are a great way to track your progress and results. Dexa Scans, Inbody Test and callipers are just some of the ways to keep track. Another expense which is not strictly necessary. The results can throw you off track, if they come back higher than expected. The tests are not always accurate, reliable or consistent. It is best to do these tests 3-4 weeks apart and at the same time, each time for the most accurate results. The best time is first thing in the morning, without food, fluids or exercise. For women, avoid menstruation time or full moon. Best to get a professional on the day or have someone you trust do your hair for you. You may be too nervous and anxious to do a good job yourself, and you deserve to relax on ‘show day’! Many women use hair extensions – so you could buy tape or clip extensions which can be re-used after the show. This is a job for the professionals ONLY! A tan at your local beauty salon or from your friend will not be dark enough. Your tan is probably one of the top 5 things you need to get 100% right, as being too dark, too light or blotchy will certainly lose you points on stage. You will need to see your tanner within 2 days before your competition for your base coat, and again on the day of your competition for your top coat which you then wear on stage. This is another job for the professionals. The stage lights are bright, so makeup must be quite heavily applied to make the most of your facial features and to avoid looking under-done. It’s also important for your stage make up to match your stage tan! False nails are optional, however many competitors like ‘complete package’ the look. You can use stick on nails, but be careful – they can pop off on stage! Let me say, I have experienced this before. A manicure will do the job, with a French polish. Judges rarely look at finger nails, but it’s just another aspect of your overall presentation. I recommend all my girls get a Brazilian wax, as our bikinis are tiny! Many also wax their forearms, underarms, legs and eyebrows. Make sure you book all waxing at least 2-3 days before your first coat of tanning goes on. Accessories are certainly something to choose wisely. You want to look elegant, without being over the top and detracting from your physique. Look at past competitors to get an idea of what is expected in each federation! Remember you are an athlete there to show off your physique – with some subtle accessories to enhance your look. Check your federation’s criteria for heel height, design, colour etc. Many federations DO NOT allow coloured heels – clear only. It is best to try these on for comfort and fit, therefore ordering online can be tricky! Stay as close to the venue as possible to avoid any logistic issues on the day. You want to arrive on time, calm and enjoying yourself! Also, nearly ALL airlines allow you to take ‘cooked’ foods on board, so be sure to prep your meals before leaving home and pack them in your carry-on baggage. Bikini Bite, Glazes, Oil etc. Many competitions do not allow oils, bronzers and glazes back stage or on stage – check with your federation. Coconut Oil spray for cooking is great to use as a glaze. Be careful though as it can be slippery! Make sure you take a black a towel to stand on backstage when applying. Bikini bite is great to keep your bikini from moving on stage and to keep everything in place (I recommend using the spray on, not roll on). Also try to get someone else to apply it for you, as it can lift off your tan! Most competitions assign 1-3 stage photographers on the day, so that you can later purchase high-quality stage images. Because of the stage lighting, it’s often difficult to get good pictures from the audience on a smart phone! Introduce yourself to the photographers (where possible), and express your interest in purchasing the photography packages early, so that they can get more shots of you! Photos are a great investment for keepsake, memories, and to correct your posing for future shows. Backstage photography is optional. These photos are often taken on a black or white background and can be fun, posed, or candid. At some events there are roaming photographers, which try to capture the whole ‘feel’ of the day. I personally love these candid shots! Many competitors invest in pre or post competition day photo shoots. Have you ever seen fitness models look lean and tanned in gym shots, or on the beach?? These are generally taken around comp time! These photoshoots are a great investment for self-promotion on social media if you’re a trainer, model health coach, etc. or to celebrate and show off your hard work!